There are 16 species of harrier in the world and five have occurred in the UK; two Northern and Pallid are vagrants and one Montague’s is a very rare breeder with just six pairs in 2013. It is the the very different fortunes of the other two species that I want to highlight in this post. When I started birding in the seventies Western Marsh Harrier (hereafter just Marsh Harrier) was a very rare bird indeed, declines due to pesticide contamination brought the UK population down to just one pair in 1971. Since then there has been a steady recovery and the UK population now stands at between 350 and 400 pairs. The fact that many males are polygamous and provision more than one nest makes the actual number of ‘pairs’ hard to estimate. Marsh Harriers used to breed in Poole Harbour up to the late 50’s but since then up to a few years ago they were just winter visitors/passage migrants in the county. About five years ago nesting occurred at Lodmoor and Radipole in Weymouth and last year a pair bred on the western fringes of Poole Harbour. This year there were two nests, one nest fledged one or two young, the other a remarkable four! Although Marsh Harriers have spread from their East Anglian strongholds, they have yet to colonise south-west England. Hopefully if the high productivity of the four nesting females in Dorset plus the birds on the Somerset levels continues then we will see them spread into Devon and Cornwall in the next few years. This morning Margaret and I went down to Swineham where a footpath overlooks the area where they breed and had good views of a female and the four offspring. Unfortunately as I mentioned in my last post I am without a working camera with telephoto lens at the moment and have had to ‘borrow’ photos from elsewhere. On the other hand the fortunes of the Hen Harrier has been diametrically opposed to that of the Marsh Harrier. Since I have been birding Hen Harriers have been winter visitors to the south of England, although they may have bred in the distant past. Now their breeding range is restricted to upland areas of northern England and southern and eastern Scotland, plus other areas in the Hebrides, Orkney and the Isle of Man. 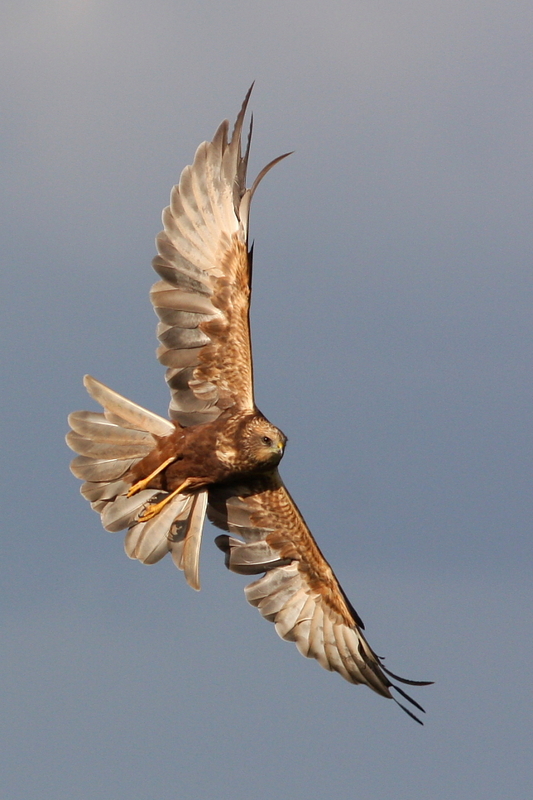 Unfortunately this beautiful bird has fallen foul of gamekeeping interests especially on driven grouse moors. It is completely illegal, but it is known that Hen Harriers have been shot and their chicks have even been stamped to death in the nest on moorland areas. It has been calculated that there is enough habitat for 300 Hen Harrier pairs in northern England, this year there were three, last year there were none. No-one ever gets prosecuted for these crimes as it hard to gain access and even harder to prove who did it, a few years ago one was even seen to be shot as it flew past the Queen’s estate at Sandringham, yet no-one was reprehended. Fewer and fewer Hen Harriers are seen in southern England in winter and most of these probably come from the areas where there are no grouse moors. 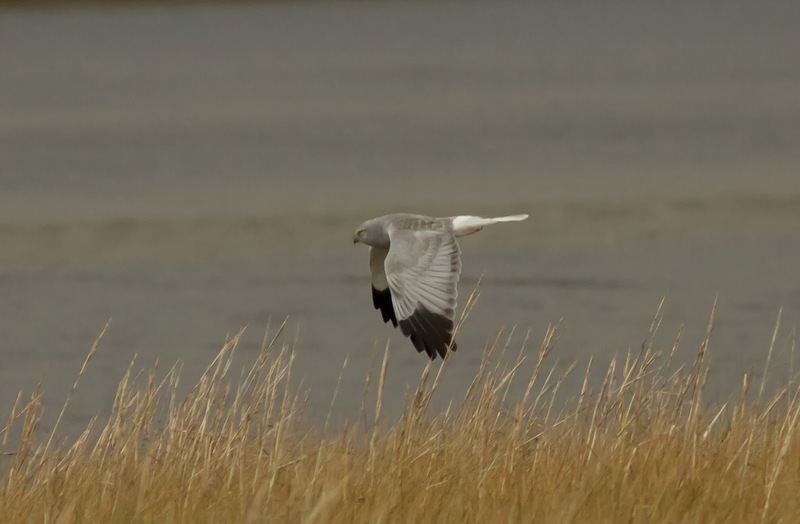 Male Hen Harrier – Poole Harbour. Photo by Phyl England. So what can be done to help this beautiful raptor, must we see it slide into extinction over vast swathes of the country just because it might take the occasional grouse, a gamebird that is raised in large numbers for no reason than to give people something to shoot at? There have been a number of initiatives recently. The RSPB has launched the Skydancer program (named after the males display flight) and a number of organisations and individuals such as Birders Against Wildlife Crime http://birdersagainst.org/, Mark Avery and Chris Packham are promoting a Hen Harrier day on 10th of August to coincide with the start of the grouse shooting season. Various events have been planned in northern England, see the above website for details. My friend Mark Constantine of Lush and the Sound Approach has paid for radio tags for the six Hen Harrier chicks that have fledged this year so it can be seen just where they go and where they might get killed in the future. The RSPB recently launched an appeal for money to pay for radio tracking, monitoring and further research. I had mixed feelings about this and wrote to them to say so. Money of course is essential to the campaign, but above all I felt they should have been getting the million strong membership to write to their MP, sign petitions and generally campaign against this needless slaughter. 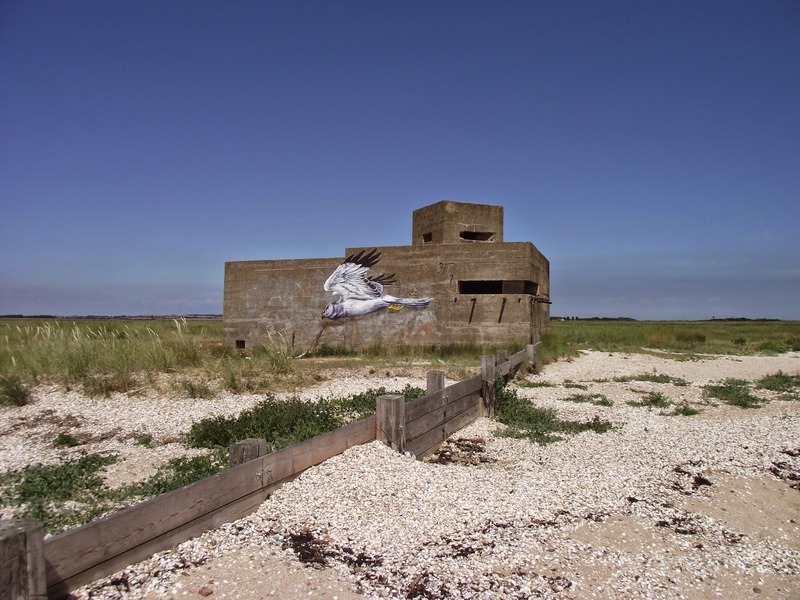 This old war time bunker is at the site of a former Hen Harrier roost on Sheppey Island. Who ever painted this male Hen Harrier is raising awareness with the general public and not just to a select few. 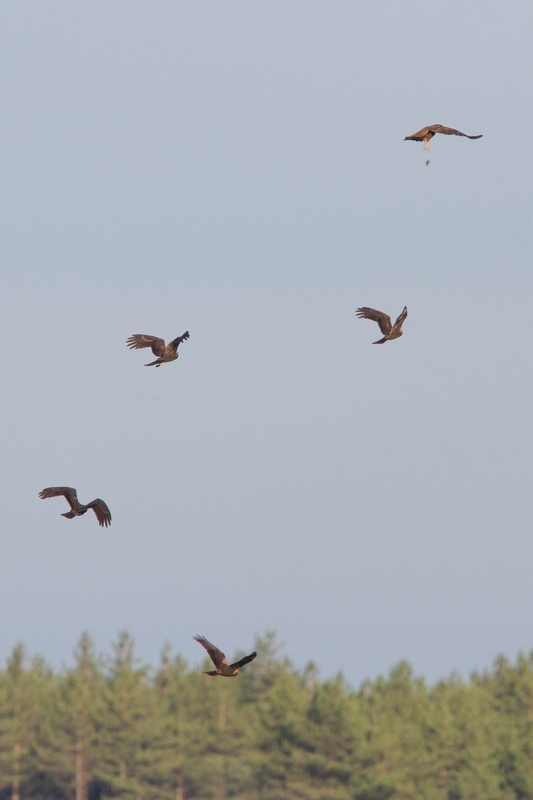 Photo supplied by Peter Hadrill who has dedicated his time to monitoring our local harrier populations.